I can’t believe Christmas is here. The week has flown by with last-minute preparations for family, and as the year winds down, I’m contemplating the direction I want my writing to go for next year. As, of now, I’m now sure which direction I plan to go, but I’ll share more later. In the meantime, I along with the rest of you will be taking a few days off to be with family and friends to enjoy this sacred holiday. But, before I go, I’d like to pass on a great article, I read this week, The Moo of Intuition. 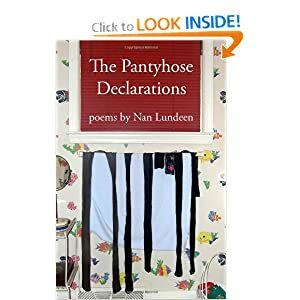 The article was written by one of my friends Nan Lundeen, author of The Pantyhose Declarations. Nan teaches The Moo of Writing Workshop, and you can find her columns in Female First. This week she wrote about listening to your intuition, and the role it plays in our creativity. For me, listening to intuition goes hand in hand with authenticity, especially in writing, staying in tuned to both is the key. I highly recommend Nan’s article. You can find her book, The Pantyhose Declarations at Amazon, and it’s on sale now for those of you who may still be looking for last-minute gifts.